Background: The main sources of antibiotic pollution are industries, hospitals, and urban effluents, as well as wastewater from farms that use antibiotics for veterinary purposes. Fluoroquinolones are very useful as antimicrobial agents and are probably among the most important classes of synthetic antibiotics in veterinary and human medicines worldwide. Despite this relevance, studies on the analysis of fluoroquinolones in wastewaters and alternative processes to degrade these compounds, and their effects on human health and environment are scarce. 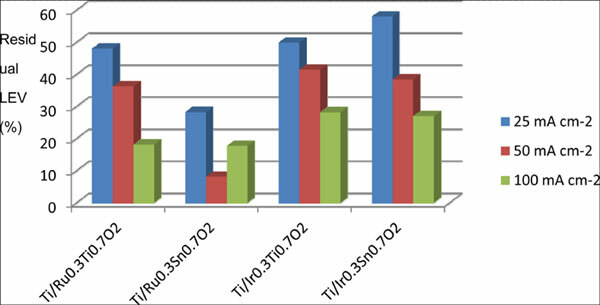 Here, we prepared different oxide electrodes (Ti/Ru0.3Ti0.7O2, Ti/Ru0.3Sn0.7O2, Ti/Ir0.3Ti0.7O2, and Ti/Ir0.3Sn0.7O2) and used them in the electrochemical oxidation of levofloxacin, an antibiotic belonging to the class of fluoroquinolones. Methods: The oxide electrodes with nominal compositions: Ti/Ru0.3Ti0.7O2, Ti/Ru0.3Sn0.7O2, Ti/Ir0.3Ti0.7O2, and Ti/Ir0.3Sn0.7O2 were prepared by the traditional method. Briefly, the precursor solution was dissolved in isopropanol and applied by brushing on both sides of the titanium substrate. The resulting material was thermally decomposed at 400°C for 5 min in a preheated oven, which was followed by cooling. This procedure was repeated until the desired oxide thickness was achieved (2 mm). Using the electrochemical cell, the electrolysis experiments were carried out by applying current densities of 25, 50, and 100 mA cm-2 on the oxide electrodes for 60 min. During this experiment, aliquots were removed at times: 5, 10, 15, 20, 30, 45 and 60 min for quantification. Levofloxacin was quantitatively determined by High-Performance Liquid Chromatography (HPLC). Results: The catalytic efficiency of different electrodes is measured as the yield of levofloxacin degradation, which in most cases reaches 50% within 1 h of electrolysis, regardless of the applied current. The electrodes bearing ruthenium afford the same % residual levofloxacin (18%) after 1 h of electrolysis under 100 mA cm-2. The electrodes that contain iridium provide similar results at all the applied currents, being less efficient as compared to the ruthenium-based electrodes. The electrode Ti/Ru0.3Sn0.7O2 presented the highest levofloxacin degradation value (levofloxacin residual is 8% at 50 mA cm-2) and levofloxacin removal rate was calculated considering order 1 kinetics (-lnC/Co=kt), for each of the applied current densities reaching 4.4, 4.9 and 4.5 mg L-1min-1 for the experiments at 25, 50, 100 mA cm-2. Therefore, the Ti/Ru0.3Sn0.7O2 electrode affords the highest yield and the best cost/benefit ratio. Conclusion: In this work, electrodes were prepared with different compositions to study the catalytic efficiency in the degradation of levofloxacin, an antibiotic belonging to the class of fluoroquinolones. The mixed oxide electrodes prepared herein have proven to be an efficient alternative to treat effluents contaminated with organic compounds. The electrode containing RuO2 and SnO2 oxidizes levofloxacin the most efficiently, reaching a removal efficiency of 92% (4.9 mg L-1 min-1) under 50 mA cm-2. Hence, the substitution of Ti for Sn generates better degradation efficiency. Antibiotics, electrooxidation, levofloxacin, oxides electrodes, fluoroquinolones, antimicrobial agents.